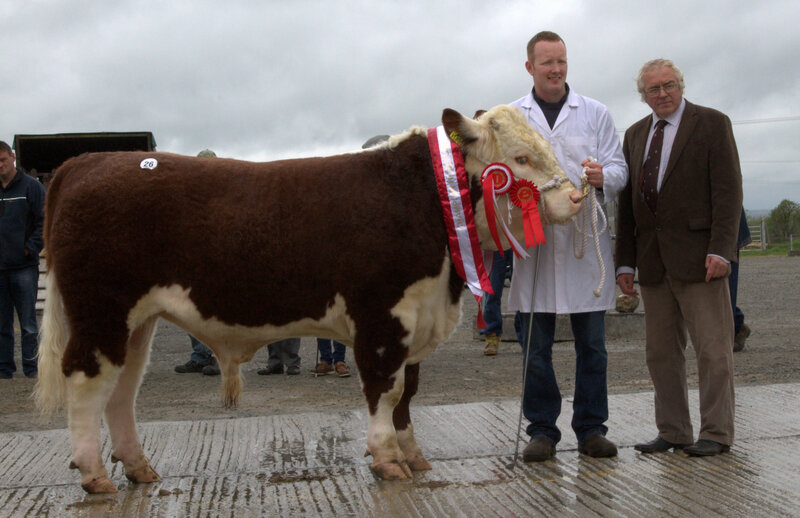 Recent strong demand for Herefords continued at the Irish Hereford Society’s recent sale at Kilmallock. Bulls sold to a top price of €3,700 to average €2,900 with an excellent clearance of 88%. 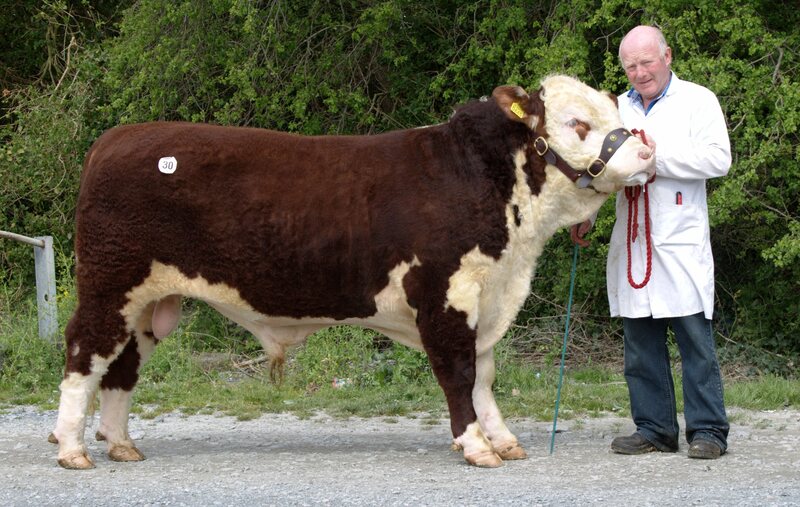 The Champion Clondrina 1110th by herd sire Balleen Gilbert was bred and exhibited by well-known Co Clare breeders Gerry and Declan Donnelly, Lisseycasey, Ennis. Out of a homebred dam Clondrina 881st by Dunlever Umbert he sold for the top price of €3,700 to Sam and Nigel Heatrick, Glaslough, Co Monaghan. 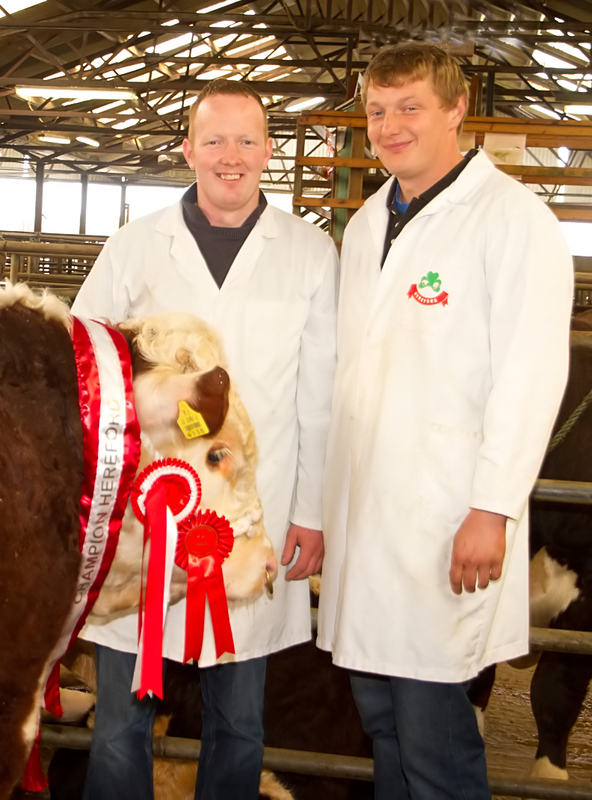 Padraig McGrath, Elphin, Co Roscommon a regular exhibitor at Kilmallock had two bulls on offer at the event. Kye Hotshot 647 and Kye Harry 665. Both bulls are sired by UK import and herd sire Free Town Hotspur which also sired the €4,600 top price bull at the recent Nenagh sale. Hotshot 647 out of Kye Shelia sold to Garret Ducey, Youghal, Co Cork at €3,500 while Harry 665 out of a Churchill Storm daughter Kye Sorcha 2nd sold to Richard Heffernan, Donohill, Tipperary at €3,400 a satisfactory day out for the Roscommon man. Towra Brilliant a thirteen month old son to Mawarra Sentimental was shown by relative newcomer to the scene John Nash, Towra, Cloughjordan. This promising young thirteen month old sire is out of a Yarram Pompeii V055 daughter Towra June and was purchased at €3,250 as a potential herd sire for the Balleen herd of Tom Brennan, Freshford, Co Kilkenny. 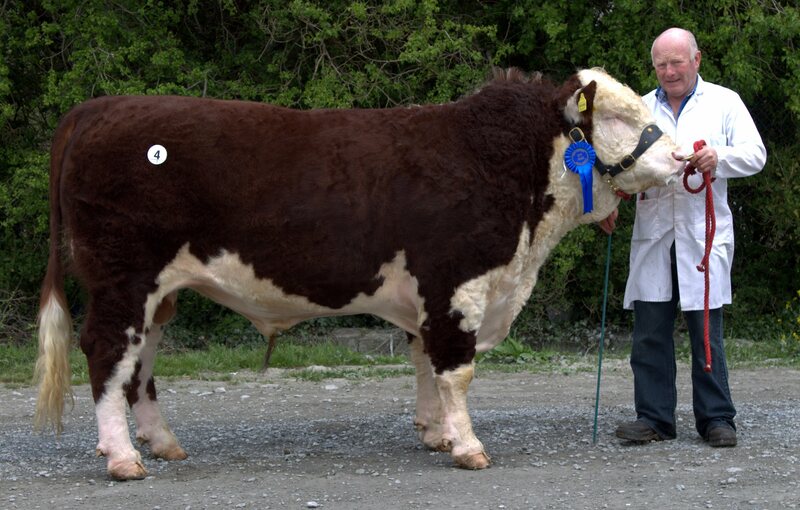 The Reserve Champion shown by veteran Hereford breeder Tommy Dunne, Kildorrery was Oldcastletown Terence. 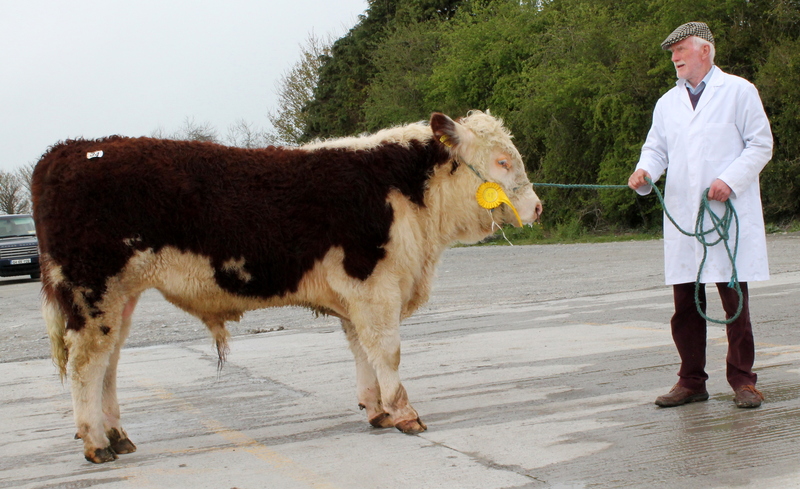 The purchaser was Frank Matthews, Drumcollogher, Co Limerick. This bull is out of a homebred cow Oldcastletown Pearl by Trillick Best. Pat Molloy of Lurgan, Moate, Co Offaly another relative newcomer to the scene exhibited Kilfoylan Saviour a son of Ardlahan Julie he is sired by Brocca Saviour. He sold at €3.150 o Michael Kennedy, Fermoy. Other prices of note included Furaleigh Ben from Ted O’Sullivan at €3,000 to Noel O’Grady, Kilmallock, Oldcastletown Jim at €3,000 from Tommy Dunne to John Myers, Knockevevin, Kilmallock and Moyclare Nelson from Michael Molloy again at €3,000 to Sean Cagney, Granagh, Kilmallock. Hereford cross calves, store steers and heifers are consistently making the top prices at GVM Kilmallock each week a fact which has not gone unnoticed by those in attendance at the mart on a regular basis. This no doubt has a positive influence on current demand for Hereford bulls. 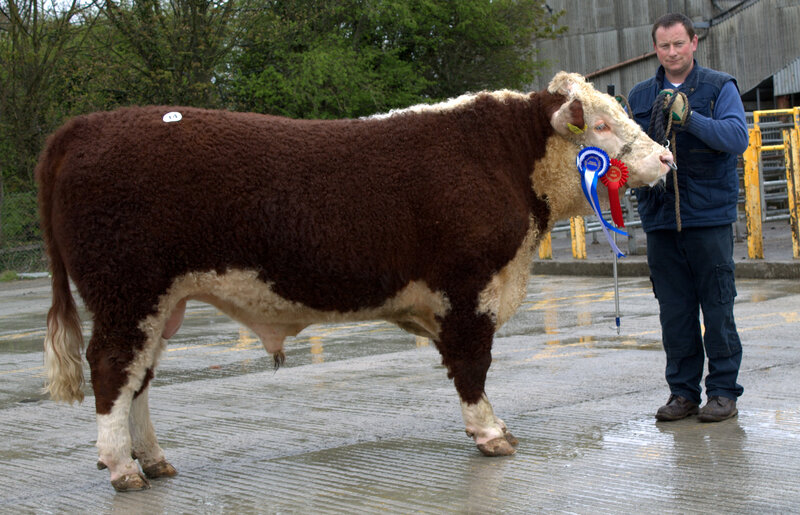 The Society’s next sale is at Nenagh on Saturday May 16th where 43 bulls are on offer.